The German Cancer Research Center (Deutsches Krebsforschungszentrum, DKFZ) has brought forward this success in health protection. The WHO Collaborating Centre for Tobacco Control, based at DKFZ, has contributed effective measures for reducing tobacco use to the public debate. In collaboration with other national and international partners it supports decision-makers in implementing such measures. “Smoking is one of the major avoidable risk factors for the development of cancer. About 40% of all cancer types would be preventable by following a healthy lifestyle,” says Prof. Dr. Dr. h.c. Otmar D. Wiestler, Chairman of the Management Board and Scientific Director of the German Cancer Research Center. Therefore, DKFZ established a Cancer Prevention Unit in the late 1990s. Its mission is to make a noticeable contribution to reducing tobacco use in Germany. The World Health Organization (WHO) designated the unit as a WHO Collaborating Centre for Tobacco Control in 2002. “Cancer prevention is possible,” says Dr. Martina Pötschke-Langer, head of the WHO Collaborating Centre for Tobacco Control. With her commitment to curbing tobacco use, she took up the fight against a major risk factor of cancer development. The WHO Collaborating Centre’sintensive communication with media and decision-makers has led to a fundamental change in public opinion about smoking and secondhand smoke over the past ten years. In 2005, the publication “Passivrauchen – ein unterschätztes Gesundheitsrisiko” (Secondhand smoke – an underestimated health hazard) ignited a public debate about health hazards from secondhand smoke and laid the foundation for the introduction of non-smoker protection legislation in 2007. Along with repeated tobacco tax increases, restrictions in tobacco advertising and a variety of other measures advocated by DKFZ, this has led to a change in attitude. Today, public smoking is no longer accepted and is therefore hardly present any more. The resulting significant decrease in tobacco use, particularly among youth, substantially contributes to public health. 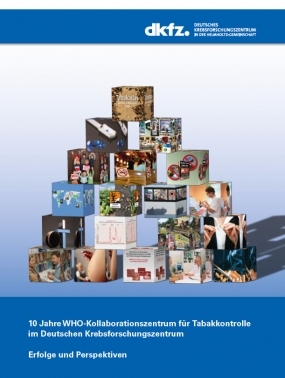 On the occasion of its tenth anniversary, the WHO Collaborating Centre for Tobacco Control has issued a publication entitled “Ten Years of WHO Collaborating Centre for Tobacco Control at the German Cancer Research Center – Achievements and Prospects”, which will be available in English early next year. The publication will be available for download at www.tabakkontrolle.de or as a printed booklet at the Division of Press and Public Relations of DKFZ.